April Fools’ Ride, Saturday, April 13 – Bike to the Sea, Inc.
Bike to the Sea is kicking off the warm weather bike-riding season with its annual April Fools’ Ride on Saturday, April 13. 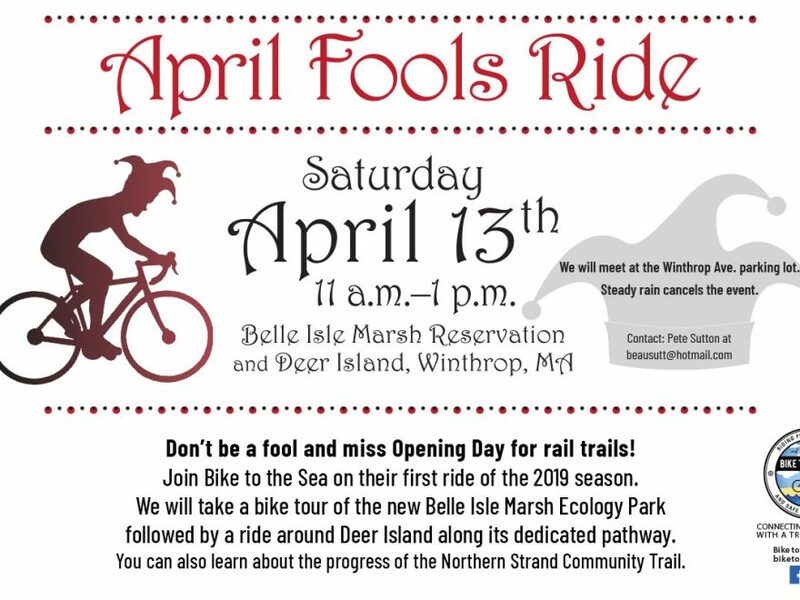 The ride will start at 11 a.m. and will include a tour of the new Belle Isle Marsh Ecology Park, followed by a tour around Deer Island along a dedicated pathway. Riders will meet at the Winthrop Avenue parking lot near the Belle Isle Marsh Reservation. The ride is expected to end at 1 p.m. For more information contact Peter Sutton at beausutt@hotmail.com. Next Post:Saugus Cleanup Set For Saturday, April 27.